You are here: Home > Media > Blog > The one million missing homes? The one million missing homes? The relationship between housing supply and demand is always going to be of interest to those (like us) who care about living standards and housing costs. The ONS household figures published last month have prompted us to think more about this topic, especially given the new data suggests fewer households will form over the next 25 years than previously expected. 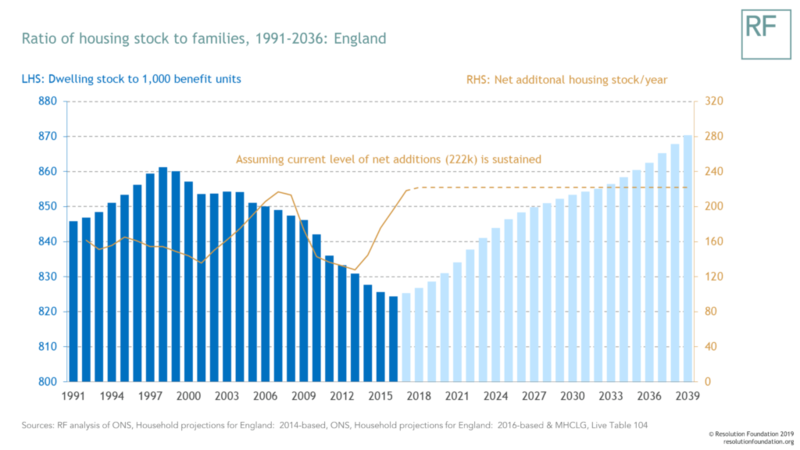 The downward revision is significant: while the 2014-based figures anticipated an average 210,000 additional households a year would set up in England over the next quarter century, the latest batch of numbers now suggests an annual total of 159,000. So is the (population) pressure off when it comes to the need to build new homes? The household data allows us to explore this important question, but perhaps not in the way that is immediately obvious. These figures are sometimes used to argue that we already have abundant housing stock: as Figure 1 shows, although the ratio of dwellings to households has fallen in recent years, it is higher than it was in the early 1990s. In fact, for every 1,000 households living in England in 2016 there were 1,045 homes to go round – surely a sign of housing plenty? As we’ve pointed out before, however, the household is not the right unit of analysis to explore many a housing question. A household comprises all those living in a property (so long as they share facilities like a kitchen or a living space). Contained within the definition, then, is the supply constraint: a household can only form if there is a building in which to do that. As a result, plotting households against dwellings as we have in Figure 1 is a tautological exercise that tells us very little about the real pressure for housing. But if the household is not fit for purpose to explore the relationship between housing supply and demand, what is? A far better approach in our view is to look at the number of dwellings per family (by which we mean a single adult or couple along with any dependent children – or what is known in less pretty parlance as a ‘benefit unit’). While there is no official estimate of family units in the UK it is possible to bottom out past, present and future numbers from the household population data. So what happens if we substitute families for households in our exercise comparing housing supply and demand? A very different picture emerges from that observed in Figure 1. 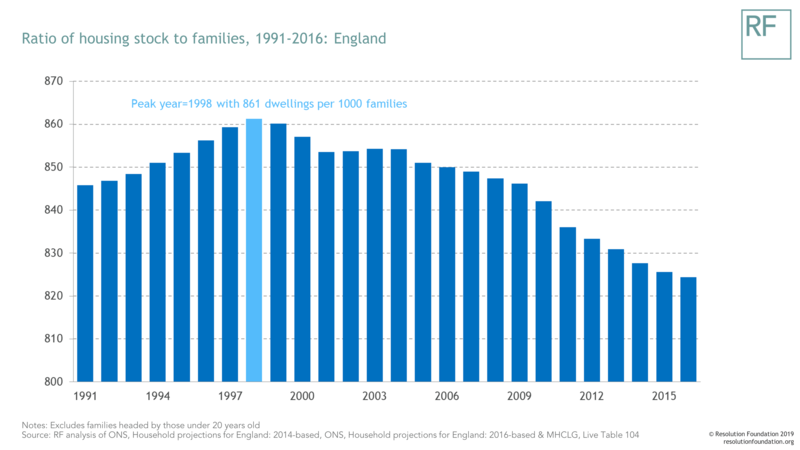 As Figure 2 makes clear, the ratio between dwellings and families has been falling steadily since 1998, and in 2016 stood at a significantly lower rate than any other point in the period. 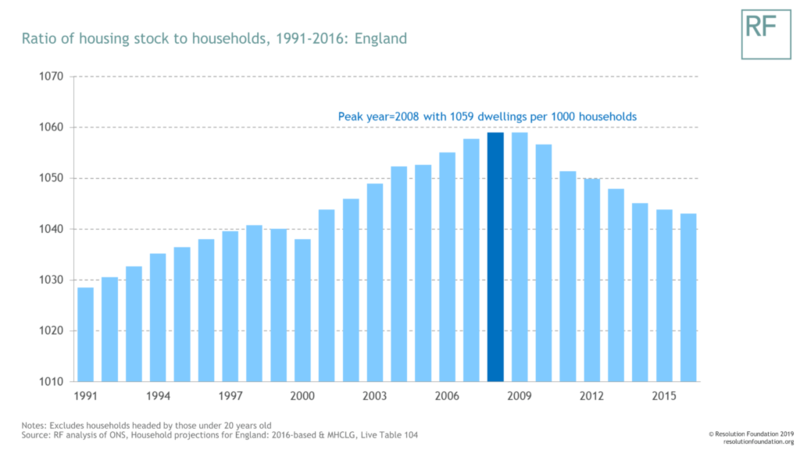 In practical terms that means there are more families sharing with others in England today than any time since 1991: more adult children living with parents (an increase of 400,000 to be precise), more private renters sharing with others (up 1.2 million since 1991), but interestingly – a point we return to later – not more people lodging in another’s home. So why have families outpaced the number of homes available in recent years? Without a doubt there have been strong demographic headwinds. To begin, natural change and especially the welcome increase in life expectancy experienced by the bulge of baby boomers has driven up the number of adults in England over this period. Likewise, inward migration has clearly played a role. 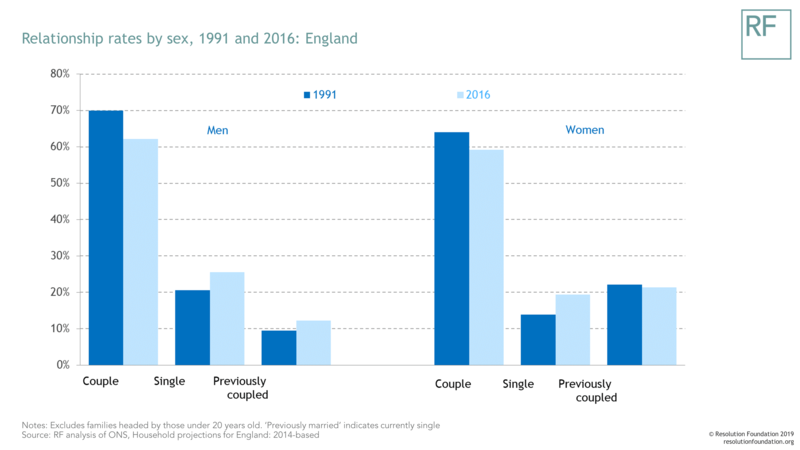 While dwelling stock may have kept pace until recently with this growing number of adults in England, critically for our family measure in 2016 fewer people shared a home with a partner than in the past. Figure 3 shows how the rate of couple families has fallen over time due to both later partnering and rising rates of separation, driving up the number of dwellings required by the same number of people. As a result, at least in the first instance it is hard to escape the conclusion that as a country we have not built enough homes to keep up with population trends over the last 25 years. Sustaining the 1998 ratio of dwellings to family units would have required building 1 million more new homes in England by 2016 (or 620,000 more if the 1991 ratio had been maintained). However, this might not affect housing demand if the aggregate preference to share one’s home had increased apace. So do we think this is the case? Getting at this question is tricky but three things are worthy of note. First, the growing number of migrants living in the UK over the period could have had a compositional effect on housing demand. It seems plausible that migrants have a stronger predilection than non-migrants to share accommodation given weaker social networks and the desire to maximise savings and remittances. We certainly see this reflected in behaviour: non-UK born individuals are more likely to share their homes than the UK-born (28 per cent compared to 24 per cent in 2016). But second, and working in the opposite direction, there are some parts of the population that have an increased propensity not to share over this time. We know from previous research that older people are much less likely to live with adult children or other family units today than in the past. Our latest analysis suggests that 16 per cent of those aged 65 years-plus shared with another family in 1991, a figure which had fallen to 11 per cent in 2016. This might not be something older people actively choose: family members might live further away today, making cohabitation unfeasible. The rise in female employment could also mean there is less capacity to look after older relatives at home. But it could signal positive change: better health allows older people to live independently for longer now, while housing costs are more manageable on retirement incomes than previously. Whatever the reasons, however, older people today clearly have a higher demand for housing than in the past (and that’s before we factor in their ability to satisfy a growing appetite for second homes). 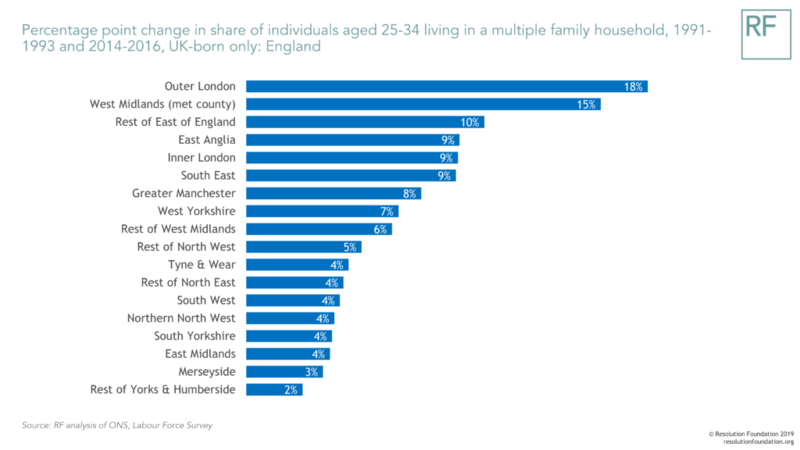 Third, in 1991, 18 per cent of 25 to 34 year olds who are UK-born lived in a multiple family home, compared to 23 per cent in 2016. Is this an active choice? Young people are more likely to go on to further education today, a societal shift that might increase the preference to share. But if this were true it would be reasonable to expect this effect to be evenly spread throughout the country and Figure 4 suggests this is far from the case. The proportion of young people sharing with others in outer London has increased by 18 percentage points since 1991, for example, compared to an increase of just 2 percentage points in parts of Yorkshire and Humberside. While further research is needed to fully unpick the reasons why young people are increasingly likely to live together, this certainly seems to suggest that a large part of their behaviour is involuntary. If the household is not the right unit of analysis to help us understand the past relationship between housing supply and demand it is even less useful when thinking about the future. To be fair, the household projections are plastered with warnings to this effect. Figure 5 suggests that the downward trajectory in the ratio between dwellings and families may have reached a tipping point: if current levels of new additions to English housing stock were sustained we would see the ratio begin to rise. However, in this scenario progress would still be slow, with the peak of 861 homes for each 1,000 families that we observed in 1998 not being reached again until 2036. Aiming to build more than the current rate therefore seems sensible. We estimate that if the government’s house building aspiration of 300,000 new units a year was achieved we would see a return to previous form by 2028. For nigh on two years now there has been an active debate in the housing world about whether there is truly a shortage of homes in the UK. Switching our attention from the household to the family as we do here is critical, in our view, to analysing this question in a more productive way. There is clearly work to be done to explore whether the rise in sharing we observe is an active choice, rather than a response to supply-side constraints. Likewise, we should ask whether the ratio between dwellings and families in 1998 is the ‘right’ level of housing to work towards. Indeed, population pressures and the fact that housing is a superior good both suggest the ratio should drift up over time. But these (very interesting) questions aside, on current evidence it is hard to conclude that housing supply and demand are happily aligned in England today. An additional £2bn for affordable housing – a big deal or just small fry?